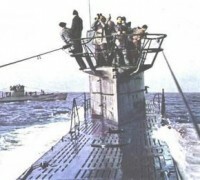 A large oil slick is seen on the south Atlantic surface where U - 161 was attacked and sunk. All crewmembers perished. Picture of Capt. Albrecht Achilles. His men regarded him in high esteem for his leadership. 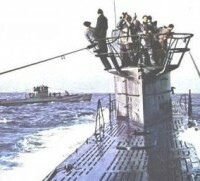 Report of action and the sinking of U 161. Damage to electrical conduit above port from shrapnel - port wing is visible through port. Rare picture from the arrival of VP 74 P2 PBM at Aratu Seaplane base. Crewmember is carefully removed from the aircraft. Another detail of the removal of Ensign Brett or Radioman Bealer from the PBM as soon as it arrived at Aratu Sepalane base, Bahia. Injured crewmember is assisted by their comrades. Later both men recovered from their wounds.